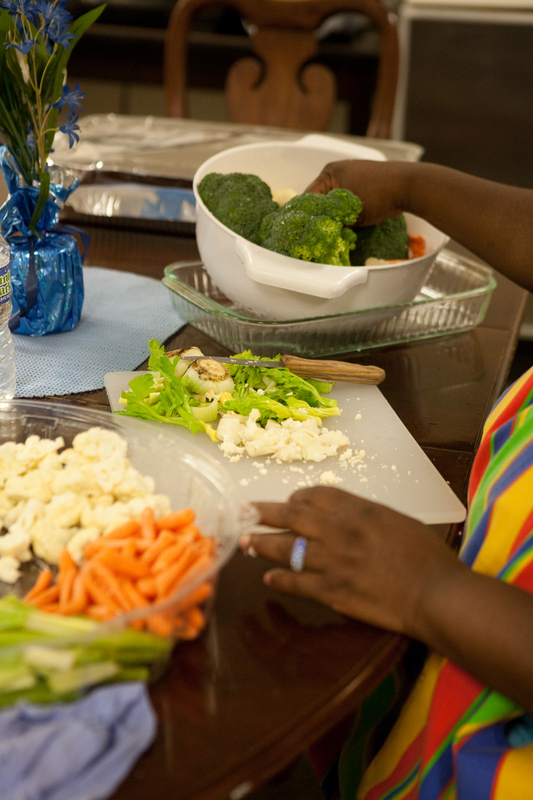 At Restoration Urban Ministries, residents are nourished. Eligible residents are encouraged to apply for a Link Card which enables them to purchase food at local markets. Residents may receive food through our Food Pantry every two weeks. Four lunches per week, at a cost of 25 cents each, are available to Restoration staff, residents, and their families. Residents may also cook their own meals using one of the facility’s stoves and ovens during the kitchen’s open hours each afternoon and evening. The kitchen is monitored by Restoration residents as a part of their mandated work hours during their stay. Large dining tables and chairs are provided so families can share meals in a comfortable, sit-down, sharing environment. Resident rooms come equipped with a full size refrigerator, microwave, and crock pot so that residents can store and prepare food in their rooms. There are several charcoal grills located on the property. This kitchen facility was built entirely from volunteer labor. 100% of the equipment was donated by local businesses. The food served in the kitchen is donated by area businesses or purchased using funds raised by selling lunch tickets.